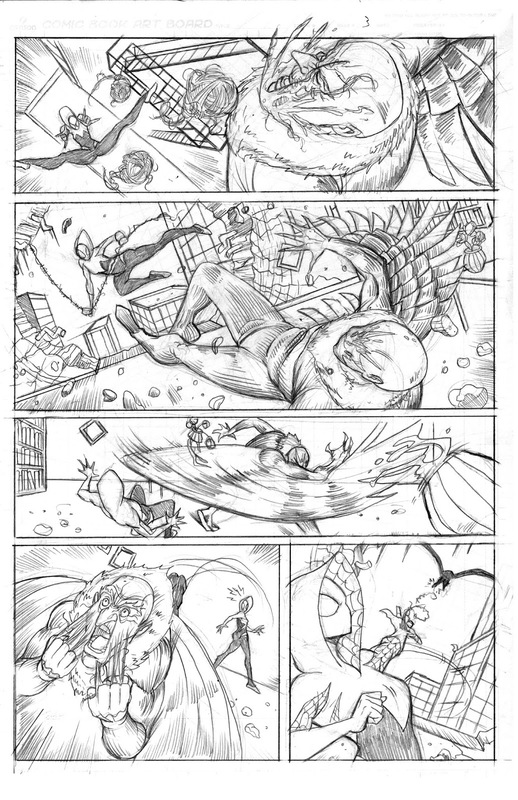 new sample pages featuring Spider-Man and Hawkeye, let me know what you guys dont like about em!! Spider-Man is above the explosion, so he is blown up and away from the blast. He loses his grip on the phone, and it starts to fly away from him. 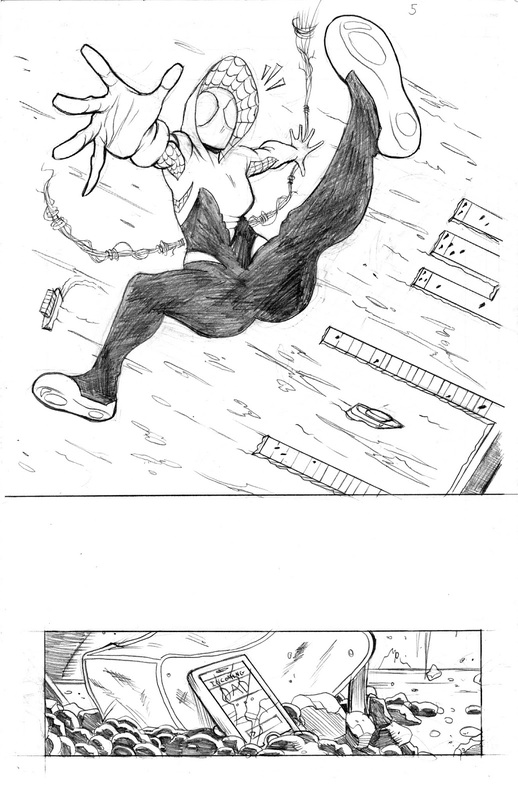 Panel 2: Spider-Man stretches out as he and the cell phone fall back towards the street. He’s shooting a web shooter to catch the cell phone. 3. SPIDER-MAN: It doesn’t have a case! Panel 3: Close on the web connecting with the phone. 5. 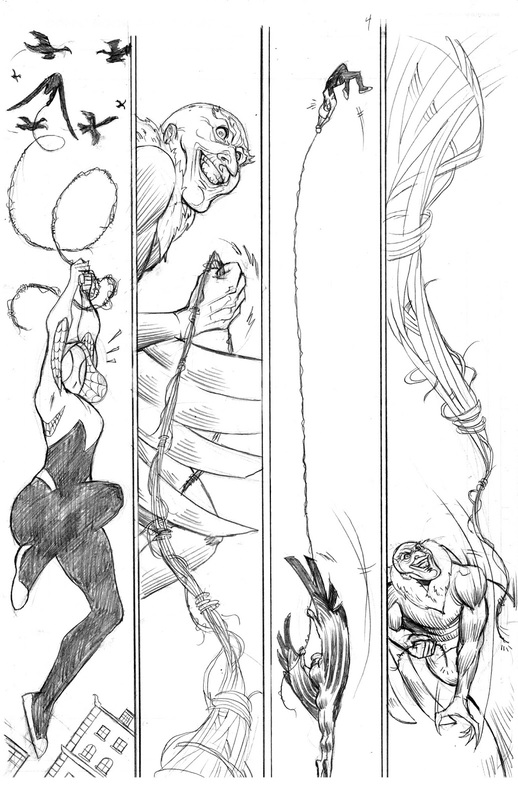 SPIDER-MAN THOUGHT BALLOON: Got it! 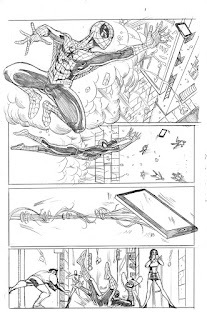 Panel 4: Close on Spider-Man landing hard on his back, phone in hand, on the sidewalk of Chinatown. There could be people running around, afraid of the big explosion. 7. 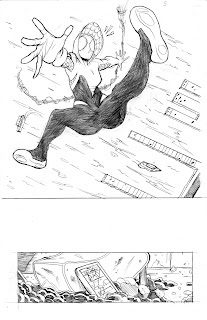 SPIDER-MAN THOUGHT BALLOON: Forgot about the landing part. 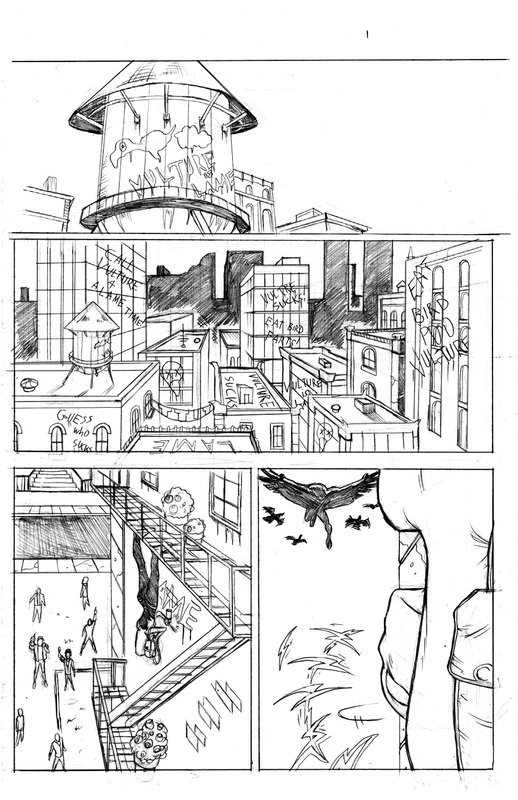 Panel 1: Spider-Man, still on the ground, looks up and sees in the street, Hawkeye. Hawkeye is in the foreground of the shot. Hawkeye is in a fighting stance. Arrow pointed towards the building where the explosion came from. That building is off panel. 1. SPIDER-MAN: Hawkeye?! What’s going on? 2. HAWKEYE: I could use some help. 3. SPIDER-MAN: Yeah. I’m happy to. Panel 2: The back of Hawkeye and Spider-Man in the foreground. In the background of the panel, in front of Hawkeye and Spider-Man is a gang of ultra-arsonists. I’m thinking they’re wearing flame retardant jumpsuits. They’ve got either big reflective goggles on, or maybe gas masks. Gas masks are always cool. Some of them are holding flame throwers, and wearing the flamer thrower packs on their backs. They should sort of look like a gang futuristic, Mad Max arsonists. 4. HAWKEYE: It’s a gang of arsonists that have been making their way through Chinatown. I’ve been tracking them for months. Thought I could handle them by myself. 5. HAWKEYE: You take the right. I’ll take the left. 6. SPIDER-MAN: I can do that. 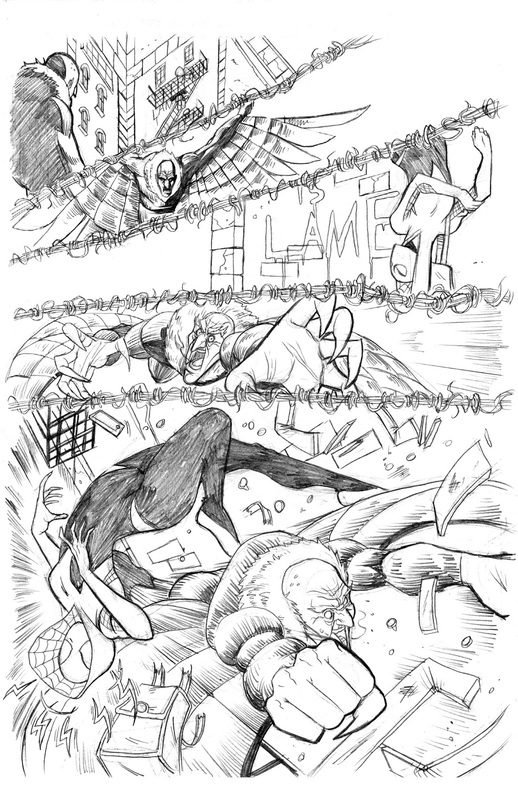 Panel 3: Spider-Man is jumping at the arsonists. He’s dodging a flume of fire being shot at him from a flame thrower. 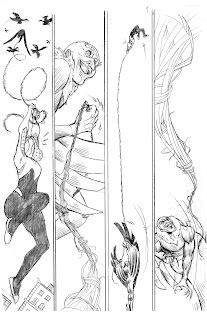 Spider-Man is firing webbing at another of the arsonists’ flamethrower. It’s blocking the nozzle. Hawkeye is dodging and rolling away from a flume of fire. He’s firing an arrow at the arsonists. 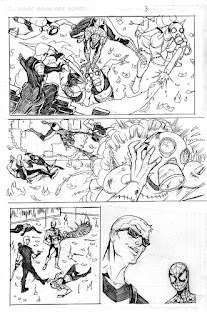 Panel 1: Hawkeye is down on one knee, taking aim and firing an arrow at the back of an arsonist with a pack on his back. Spider-Man is in the background of the panel. He’s upside down, flipping, and smashing the heads of two arsonists together. There are some arsonists already down on the ground. Panel 2: Hawkeye takes cover as the back of the guy’s back goes up in flames. 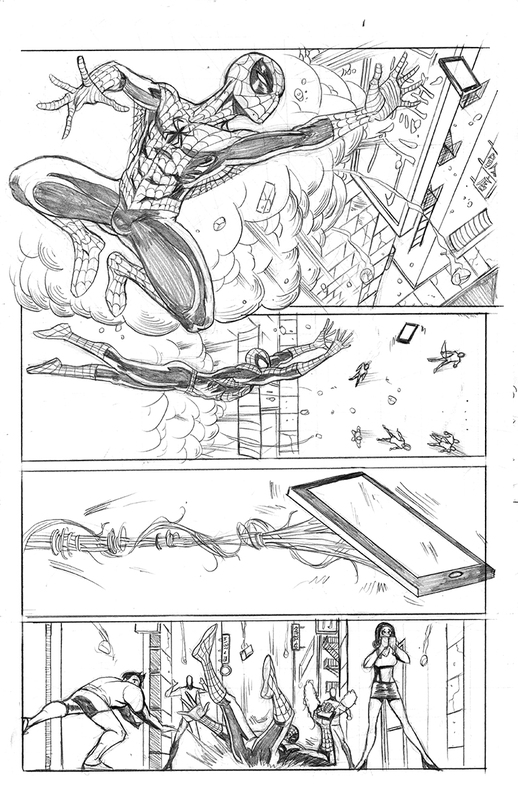 Spider-Man, who is up in the air, mid-jump, is shooting webbing at this up in flames guy. Other arsonists fly back from the force of the flames. Panel 3: That guy whose pack burst into flames is now wrapped in webbing, the flames have gone out. He’s falling to the ground. 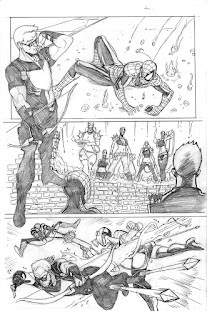 Spider-Man stands in the middle of the knocked out arsonists. Hawkeye is walking over towards Spider-Man. As Hawkeye is walking, he’s kicking an arsonist in the face, who is laying down on the ground, struggling to get up. 1. SPIDER-MAN: Those guys weren’t so bad. 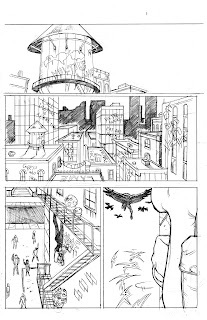 Panel 4: Same basic panel. Hawkeye is now standing next to Spider-Man. 3. SPIDER-MAN: I could eat. 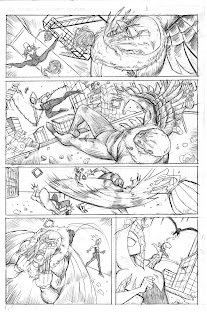 New Marvel sample pages that i just finished, let me know what ya think!